In J. V. Cunningham's translation, "See how resplendent in deep snow/ Soracte stands." In J. Dryden's translation, "O patron of Soractes' high abodes, Phoebus." This impressive literary florilegium is related to a pretty low mountain (691 m.), so it was not its height which raised such an enthusiasm. It is rather the fact that it stands alone and it is visible from a very vast area which includes Rome. Not only writers and poets were attracted by Monte Soratte, but painters too added to the celebrity of this mountain: French painters in particular, following the example of Claude Lorrain, painted several views of Monte Soratte, which they could see from the gardens of Villa Medici, the location of the French Academy. Giuseppe Vasi showed Monte Soratte in his 1765 View from the Janiculum and the mountain can still be seen from there, notwithstanding the expansion of modern Rome. Monte Soratte was sacred to Apollo and as has happened on many other occasions, the site of the ancient temple at its top was chosen by medieval hermits as the location to detach themselves from worldly affairs. Carloman, son of the French King Charles-Martel (who had defeated the Arabs at Poitiers in 732) founded a convent on Monte Soratte before moving to Monte Cassino. 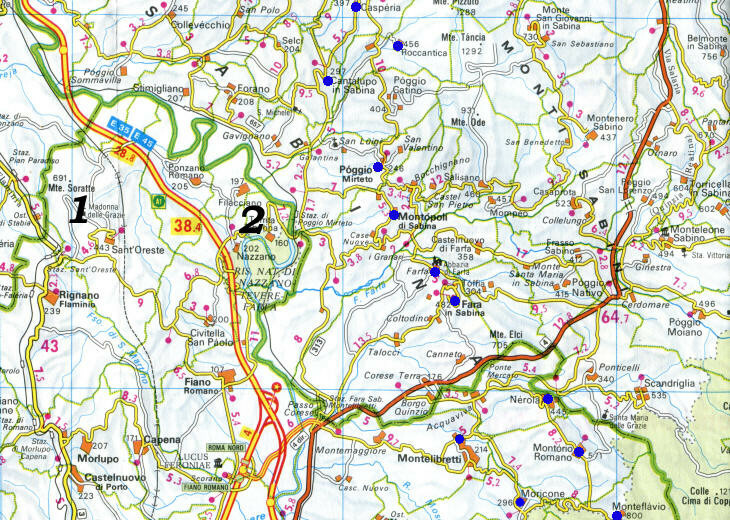 For a map of the area near Monte Soratte click here (Monte Soratte is No. 1). Sant'Oreste, the small town at the foot of Monte Soratte was described by the 1883 Central Italy Baedeker as "a miserable village", but it was an unfair comment; Sant'Oreste has several interesting buildings in addition to an almost intact curtain of walls and three gates, whereas most of the nearby towns have just one gate. Sant'Oreste has a medieval origin, but it knew a period of expansion in the XVIth century and in particular at the end of that century, when Cardinal Pietro Aldobrandini, a relative of Pope Clement VIII (Ippolito Aldobrandini), built a large monastery on the upper part of the town and more in general promoted the economic development of the area around Sant'Oreste. This explains why Sant'Oreste has so many Renaissance buildings: their size is modest but their design is elegant: a sign that at least a certain number of families in Sant'Oreste were wealthy enough to care about the external appearance of their homes. St. Oreste: you would vainly look for such a saint; the name of the town is just a corruption of Soractes, the Latin name of the mountain: medieval amanuenses thought the initial S stood for S(aint) and then changed the rest of the word to the most similar name they knew, the Greek Orestes. 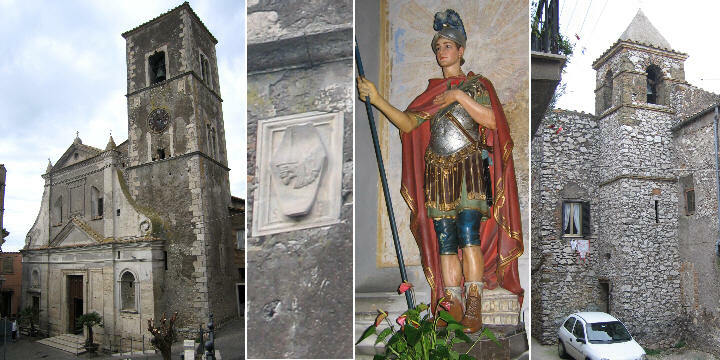 So the statue in the main church of the town, as well as the chevalier shown in the image used as a background for this page, are not related to St. Oreste, but to another saint, Edisto, who was recorded as a Roman soldier, but who is no longer in the official list of saints, as the historical evidence related to him was found to be rather shaky. Sant'Oreste enjoys great views over the surrounding countryside: in theory it is possible to see Rome, because from Rome one can see Sant'Oreste. Move on to Rignano Flaminio and Faleria.